Do fuel injector cleaning necessary? Replacing fuel injectors when they are not functioning properly, especially on high-performance vehicles, can be an expensive proposition. If fuel injectors are electrically malfunctioning, replacement may be the only alternative. However, if the fuel injector balance test indicates that some injectors are restricted, you are probably dealing with dirty injectors. In this case, cleaning fuel injectors is the best thing to do. Clean fuel injectors eliminate stalling, rough idle, and uneven acceleration among other things. Can You Clean Fuel Injectors Yourself? Should I Seek for Professional Fuel Injector Cleaning Services? 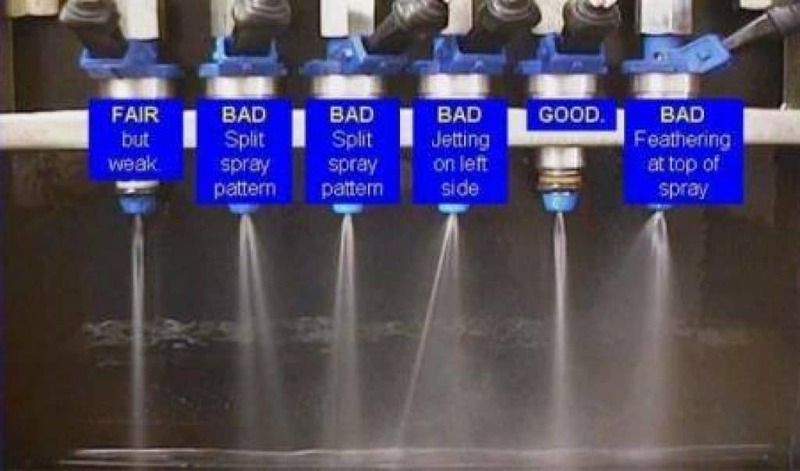 What are the Benefits of Cleaning Fuel Injectors? A fuel injector is in charge of providing a measured amount of fuel to the engine. Its internal construction is made up of a wired coil, a return spring pintle, and the body casing. The wired coil generates the magnetic field; the spring returns the pintle to its closed position. These two parts of the injector are very important. If the spring is weak, the injector’s performance will deteriorate. If a pintle channel is clogged, then you are likely to face injector problems. A dirty fuel injector is the one that will present significant problems. Usually, you can single out a problematic injector by conducting the following tests. If you cannot perform the resistance test, you can alternatively conduct a sound test by using a mechanic stethoscope to listen for incorrect injector operation. Normally, an injector that’s functioning properly makes a rhythmic clicking sound when the solenoid is energized and de-energized. You should know you have an injector problem when you hear a clunk-clunk sound instead of a click-click sound. If you don’t hear any sound, the chances are that the PCM or connecting wires are defective. If you do not have a mechanic stethoscope, use a long screwdriver, wooden dowel, or a thin steel rod to feel for a steady on/off pulsing of the injector. For this method, you need a multimeter. You need a multimeter to measure the injectors for resistance. Measure and record the resistance of each injector. Subtract the lowest value from the highest resistance value. The difference between the lowest and the highest value should be equal to or less than three ohms. You may not need to know the exact resistance your fuel injectors are supposed to have. You can just compare the readings you get. You can conduct this test to inspect restricted injectors. This test is usually necessary if all electrical tests fail to unveil the root of the problem. For this test, you will need a fuel injector tester and a fuel pressure gauge. You have to check the fuel pressure before you conduct the injector balance test. Connect the pressure gauge to the rail pressure connection. Then, connect your scan tool, turn the device on, and navigate to injector balance test. Choose #1 injector and take the first pressure reading the moment the fuel pump is shut off. Then pulse the injector by pressing the soft key. Note down the pressure after pulse the moment the pulsing of the injector stops. Go ahead and test the remaining injectors. If the maximum difference in pressure is less than 2.9 psi, then the flows of all the injectors are acceptable, and no cleaning or replacement is necessary. However, if the maximum difference exceeds 2.9 psi, then chances are some injectors are defective. Clean or replace the injectors that are different than the rest. The other test that you can conduct on your own if you have the correct equipment is the injector flow test. You can use a flow bench for this test. The oscilloscope test is another easy way to determine a possible injector problem. Use the lab scope that captures the waveform and analyzes it. Don’t forget to finalize your measurements with an actual manual injector leak down procedure. Fuel injectors spray a specific amount of fuel into the intake system. Not enough fuel will be sprayed if the fuel pressure is low. This is normally the case if the injectors are dirty. Inconsistencies cause clogged or dirty injectors in detergent levels or impurities in the fuel. When injectors become partially clogged, the flow of fuel is restricted. Spray patterns are altered, resulting into the poor performance as well as reduced fuel economy. Before I discuss the typical cleaning methods available, I would like to remind you that cleaning precautions are in order. First and foremost, you should never soak an injector in a cleaning solvent. This is uncalled for a way to clean injectors, and you are likely to destroy them in the process. Secondly, never use a pipe cleaner, or a wire brush or any other related items to unblock a plugged or clogged injector. This is so, since the metering holes in the injectors are drilled to a given tolerance. Therefore, the scrapping of the opening may interfere with the precise metering of the device. You can, but you shouldn’t if you have no idea of what you are doing. I wouldn’t advise a novice to disassemble any engine parts. The chances of you generating more engine problems are high if you have limited knowledge of how the engine works. Also, the lack of specific equipment may interfere with the effectiveness of the entire cleaning process. They are some things you have to check out when conducting a fuel injector cleaning process, including cracks and current draw. You have to inspect and confirm that there are no leakages, the fuel is properly atomized, there are appropriate fuel volumes, and the spray pattern is safe as well as efficient. 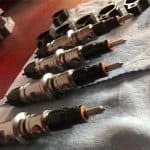 If you believe you have what it takes to take down an engine without causing any additional issues, then you should go ahead and clean the injectors manually. You can easily clean your injectors without removing them. All you need is a complete injector cleaner kit along with a PEA cleaning fluid. It is advisable to buy a cleaning kit that is ideal for your vehicle model. The best kit comes with the best fuel injector cleaner, as well as a hose for attaching the fuel injector cleaner. You are likely to achieve the best cleaning results when you use a PEA-based cleaning fluid. Cleaning fluids with PEA have a good reputation for effectively dissolving carbon deposits. Cleaning fluids containing polyisobutene (PIB) will effectively prevent the buildup of new deposits. However, such cleaners are not effective in removing existing deposits. This may be a little bit tricky, especially for a person who knows very little about engines. The easy thing to do is to use your car’s engine layout to single out the injectors. Alternatively, you can search for the necessary info/guidelines online. You might even find a video that shows you exactly how to locate the injectors. The fuel pump is usually situated on the side of your car’s engine. You can easily disengage fuel injectors from the pump by pulling them out gently. Then make sure you reconnect the pump, and the fuel return line to ensure the gas inside the return line gets back to the tank as you clean the injectors. Find the pressure regulator, then locate the vacuum line that is connected to it, and brace it gently to disconnect. Check your car manual to confirm whether or not your car has a pressure regulator vacuum line. It is normally situated behind the injectors. To do this, you need to identify the fuel port that is normally connected to the fuel rail. Follow the directions that come with your cleaning kit for attaching the hose as well as the port. The directions may vary significantly from one kit to another. Just make sure that you have proper connections both to the hose as well as the port. Usually, the cleaning kit uses a spurt of pressure to effectively inject the cleaning fluid into the injectors. Therefore, you have to make sure the fuel tank cap is removed to prevent any buildup of excessive pressure. Once you have confirmed that the fuel pump is off; go ahead and start the engine. It should take approximately ten minutes for the cleaning fluid to do its job. Read Also:Why is My Check Engine Light Flashing and Car Shaking? The final part of the cleaning process is to remove the hose as well as the fittings. Then reattach the pressure regulator vacuum hose, fuel pump, and the cap. Finally, start the engine and listen for any abnormalities as far as the noises are concerned. If possible, drive the car a short distance to confirm that it is operating smoothly. Do it yourself can have the same effect as a professional’s cleaning the fuel injectors. However, if your efforts of cleaning fuel injectors fail, you should consult a professional. After going through all the possible cleaning methods, the best way to clean fuel injectors is by using a high performance injector cleaner. You might probably think of DIY, which involves removing the injectors. But, this may not be a good idea if you know nothing about the engine and its parts. First and foremost, you should never soak an injector in a cleaning solvent. This is uncalled for way to clean injectors, and you are likely to destroy them in the process. 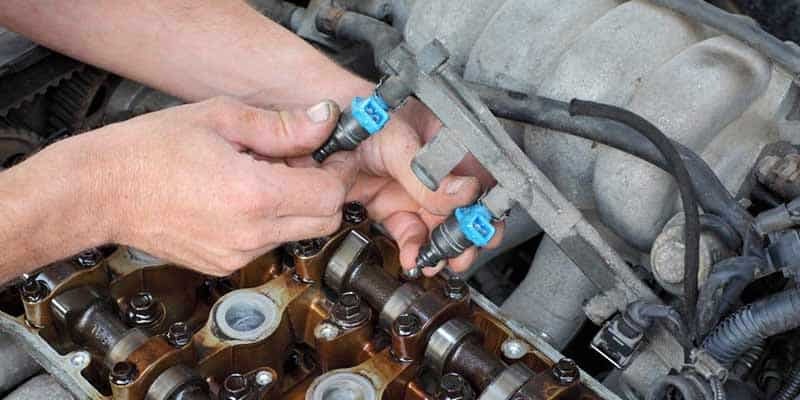 Some YouTube videos may suggest that you start the DIY injector cleaning at the inlet of your fuel injectors. However, the chances of you lodging grime and loose dirt between the pintle as well as the pintle sleeve.